All anglers will fish out of identically rigged Hobie Pro Angler 17 T kayaks. All anglers must have a current SIP for Eungella dam to fish this event. There will be no cash prizes. The care of fellow competitors and tournament staff is of the utmost importance. If an angler or a tournament staff member is in distress other competitors shall assist. Organisers shall search for late returns. Competitors shall only use mobile phones for safety and emergency purposes or to communicate with event organisers. Emergency phone numbers shall be announced at the tournament briefing. Please note that there is no mobile coverage on the dam. 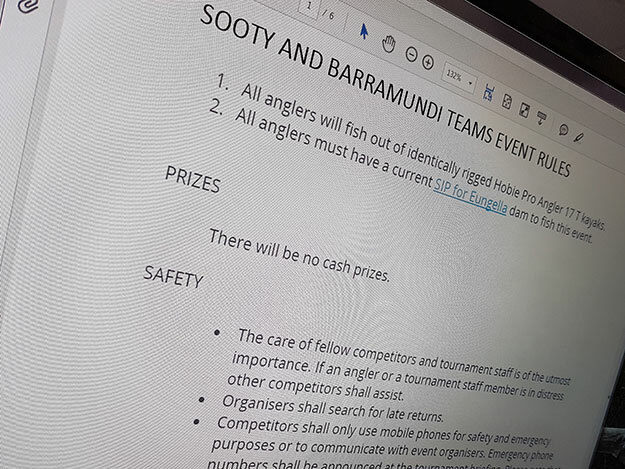 The tournament organisers reserve the right to reduce the fishing arena, change start or finish times, change the start and finish location and postpone or cancel a tournament if they deem it necessary for the safety of anglers or are required to by authorities. All tournament staff have the right to direct any angler back to shore, at any time. If the Tournament Director calls for a stop to fishing, the session shall be deemed cancelled for all anglers (whether they are or are not aware of the stop) and there will be no scoring. A pre-fish ban means anglers are not allowed on the competition waterway and linked systems for ANY REASON during the specified (pre-fish ban) dates. During the pre-fish ban no person may be on tournament waters to locate fish or gain fishing information on a contestant’s behalf. Pre-fish Ban starts and includes Monday the 6th of August 2018 till and including the 3rd of September 2018. Registration, Briefing, Start and Finish times will be provided prior to the event by the organisers. On the morning of the event, both competitors in each team shall go to the pre-arranged location to register, where both anglers must present for inspection their PFD, fishing permit. Registration will close 15 minutes before the tournament begins. Failure to register within the allocated time could cause start time penalties. Briefing shall be held after the close of registration. All anglers shall attend the entire briefing. Failure to attend the entire briefing could cause start time penalties. The event will be a mass start but tournament organisers have the right to change the start order, procedure and time. Once the start signal has been given competitors shall pedal or paddle across the defined start line in a specified direction. Fish will be placed with the tip of the lip at beginning of the ruler. The mouth of the fish shall be closed. Measurement markings shall be clearly visible. Assigned key tag with number shall be visible. Sooty grunter and Barramundi to the tip of the tail. The tail can be pinched. The whole fish, tip to tail. Only one photo per fish shall be submitted to the scorer. Photographs shall be taken from directly above the fish and not at an angle. Wet anything that the fish will touch (hands, net, measuring device). Land your fish properly using a net. Avoid handling fish by their delicate gills. Release fish immediately into the water after photographing (try to keep photographing under one minute). Competitors shall have their key tags on the board by the nominated finish time. Failure to do so shall result in time penalties at the rate of 5cm per minute (or part thereof) late. Disqualification of the bag for returns over 15 minutes late. Anglers who return late and have caught no fish shall receive a negative score. It is the teams’ responsibility to record on the catch card their session’s longest, competition legal bag of fish. The permitted number of fish per bag, per event or per session may vary. Anglers are fishing for a combined team length. When filling in the catch card, fish lengths shall be rounded up to the nearest full centimetre. g. a 50cm will be recorded as 50cm, 50.2cm will be recorded as 51cm, 58.5cm will be recorded as 59cm, 50.9cm will be recorded as 51cm. Sooty Grunter (Black Bream) must be 28cm or over to be eligible to be recorded. Note: a 27.1cm – 27.9cm Sooty Grunter can’t be rounded up to achieve a competition legal fish length. Barramundi (Giant Perch) must be 58cm or over to be eligible to be recorded. Note: a 57.1cm – 57.9cm Sooty Grunter can’t be rounded up to achieve a competition legal fish length. Write your names on the provided plastic bag. b. Fill out fish details, sign and date your catch card and place in the bag. c. Place your camera card in the bag. d. Submit your plastic bag to the Tournament Scorer. e. Camera cards will be available for collection at the completion of scoring. Ties will be settled on count back. The angler with the longest and then subsequent longest fish shall gain the higher place. If anglers cannot be split, they will share the placing. If one member of a team breaches a rule the penalty will be applied to the both members of the team. All competitors shall wear the supplied Australian Standards Lifejacket or Personal Floatation Device (PFD) at all times while on the water. All competitors shall be issued with a key-tag and shall return it to the key-tag board before the finish time. Anglers must obtain permits or licenses for the waterway being fished. Organisers will not allow a competitor to compete without the legal licences and permits. Competitors shall abide by all state fishing and boating regulations. Trolling is not permitted – lure and fly casting only. Trolling is defined as using the momentum of a propelled kayak to give the lure action. Casting along a stretch of bank under pedal or paddle power is permitted if for maintaining the kayak’s position. Before altering a kayak’s position, all lines shall be removed from the water. The event organisers reserve the right to disqualify anglers deemed to be purposely trolling. Long Lining is not allowed. No fishing from outside the kayak, including fighting and landing fish. Kayaks should remain a cast apart (30 metres) while fishing. No fishing or casting into the no fishing area near the dam spillway. Once an angler has caught, measured and photographed a fish it shall be released. Each angler shall only use one rod at a time. This includes when a lure is snagged but still attached to the rod, anglers cannot pick up another rod and begin casting. Tandem Kayak Teams have a shared length and shall only photograph fish that have been caught by members of their tandem team. In emergencies, organisers reserve the right to accept or refuse early scoring of catches. Any complaint regarding rule breaches rules shall be submitted in writing to the Tournament Director within 10mins of the close of the session. The Tandem teams event consists of two anglers. One angler can not compete without their partner unless the tournament director authorises it. The rigging, scoring and registration areas are work places and designated non smoking areas. Concerns regarding rules can be discussed with tournament director BEFORE the tournament. All rules are applied as interpreted by the tournament director. All contestants shall follow the highest standards of sportsmanship, courtesy and conservation and conduct themselves in a manner that is a credit to themselves, to Hobie Fishing, Hobie Fishing’s sponsors and the efforts to promote the sport. No consumption and/or possession of alcoholic beverages or any kind of mind-altering substance during registration or tournament hours including the scoring procedure. Anglers are to refrain from using words, conduct or actions reflecting unfavourably upon efforts to promote safety, sportsmanship, fair competition and compliance with tournament rules. This includes verbal communication and social media. If conduct occurs that does not comply with the standards outlined above, Hobie Fishing has the right to disqualify a contestant or team. WHAT ARE YOU GIVEN FOR THE DAY? The organisers shall supply each Team with two measuring devices. The device shall be returned at the completion of competition. The event organisers shall supply a numbered key tag to each Tandem Kayak Team. The key tag shall appear in all catch photos to prove that the fish was photographed on that day. WHAT EXTRA ITEMS DO I NEED TO TAKE TO A CATCH, PHOTO AND RELEASE TOURNAMENT? A high resolution camera that has a removable memory card. The camera shall have the current time and date set on the camera. Note: iPhones or Smart phones are not permitted to be used for taking photographs unless they have a removable card that can be read on the Tournament Director’s laptop.